sailboat. 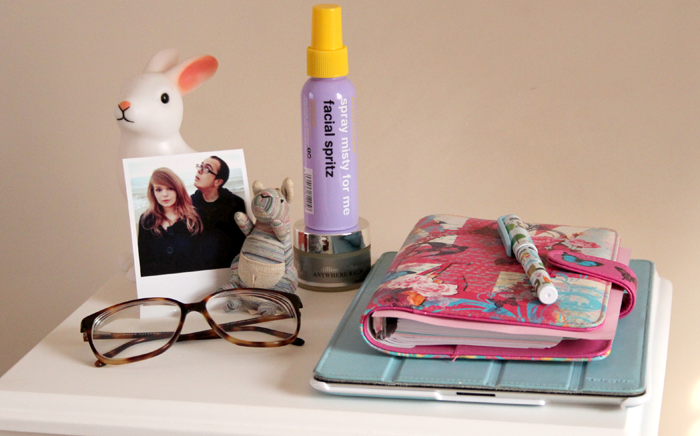 : What's on my bedside table? I first put up one of these posts a little while ago, but things have changed a little and since I loved writing the last one so much I thought, why not write an updated one? So here I am, I hope you like being as nosey as I am! I'm definitely not the neatest person, I often start out with the best intentions but before long, a little bit of clutter somehow manages to accumulate. My new nightstand♦ was gifted to me by Out There Interiors and I really like it. The two little drawers are really sweet and roomy enough to store all those millions of cables that seem to multiply during the night but are needed to charge something or other! It's not a super heavy piece of furniture and although it does seem a little on the pricey side, I think the price tag reflects all the little details and the overall aesthetic is a little nicer than my other bedside table which is from ikea. 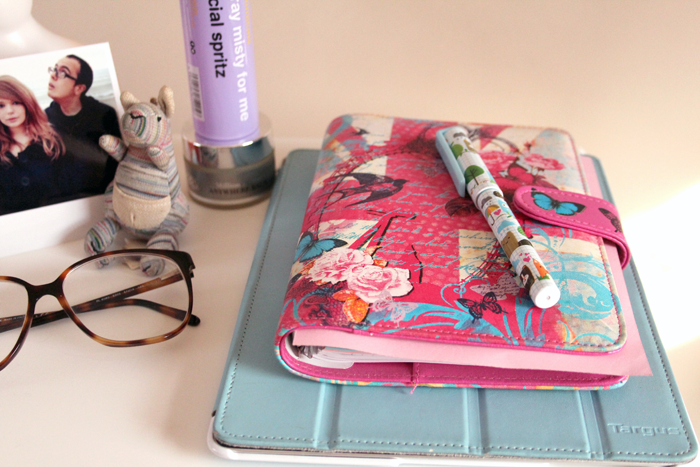 My Paperchase organiser is practically glued to my hands at all times otherwise I simply wouldn't keep up with all the things I have to get done. I often get distracted so I have to make little to-do lists on a daily basis otherwise I think I'd get myself in a bit of trouble for being late or forgetting to send that important email. My iPad is also something I'm not sure what I would do without. When I first got it I thought it was a little bit of an unnecessary luxury but now I think it's super useful, as well as occasionally being a little distracting, candy crush I'm looking at you here! Beauty product wise I have the Organic Surge Million Dollar Anywhere balm, which I've mainly been using as a lip balm and the Anatomicals Spray Misty For Me facial spritz♦ that was in this month's GlossyBox. 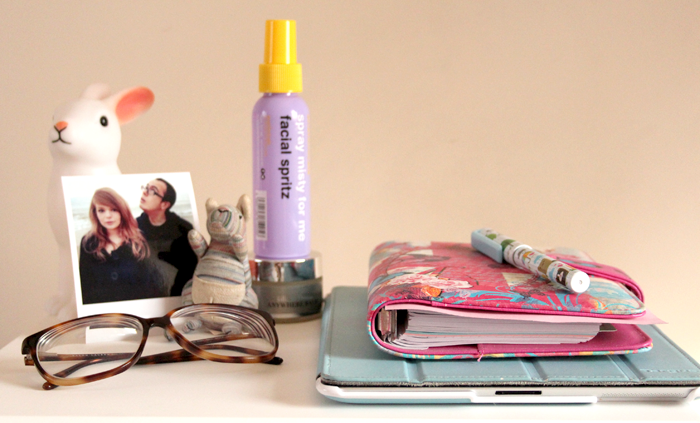 The spray has been so nice to use over the last few days especially when the nights have been really warm and uncomfortable and the balm is just an absolute favourite skin care product of all time - it's one of those multi-purpose products that ends up being useful for pretty much everything! 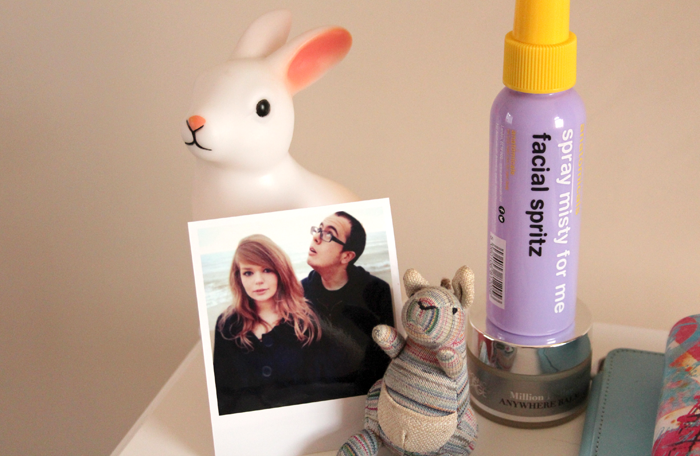 Lastly I have the bunny lamp♦ from DotComGiftShop that is beyond popular and for good reason, it's absolutely gorgeous! 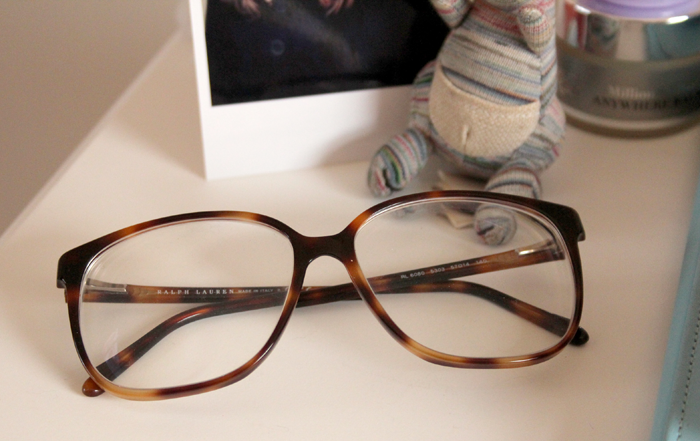 My glasses are a must have because I am as blind as a bat without them as is my little Muji kangaroo that used to be a keyring but now he just lives here, this was a gift from M a really long time ago! And finally, of course I have a picture of us a couple of months after we first met. It's a print of one of my instagram pictures from Printic♦, a super quick and user friendly app that I recommend if you're looking to get some of your instagram pictures printed. I know there are a million different sites and apps that do this and I haven't tried them all, but this is my favourite. P.S. I'm a little behind on replying to your comments, but I promise that I'll catch up over the next few days! I haven't had much spare time for blog reading and I've missed it so much so I'm very excited to catch up on all of your posts! Thank you for leaving your sweet thoughts here all the time, they mean the world! This is such a sweet post, interesting too! 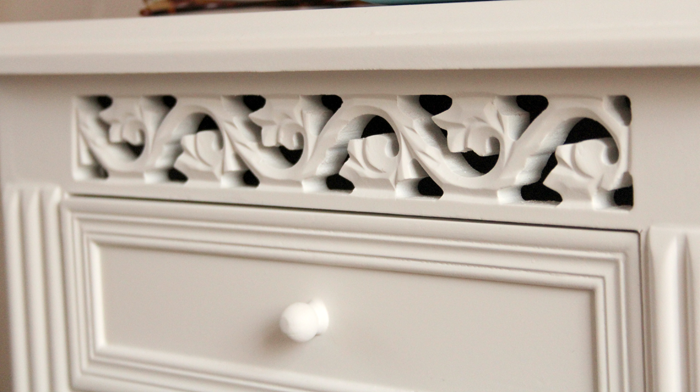 And that dresser is beautiful! A little bit in love with your nightstand, my room is too small for lovely furniture like that! Wah! P.S. - pass the organiser over here, I needs it. Beautiful! I dream of a beautifully organised bedside table but my ancient little table is just covered in books, beauty bits and every magazine I've read in the last month! You've inspired me to utilise it as the handy storage/ pretty space it could be! Love these little posts! I might try the facial spritz out as the packaging is SO CUTE it seems really reasonably priced! Would you recommend it? The bunny lamp is so cute! I am kinda curious about the facial spritz. It seems like a great product to try out. I have seen this but haven't tried it yet. I think I'll try it this time. 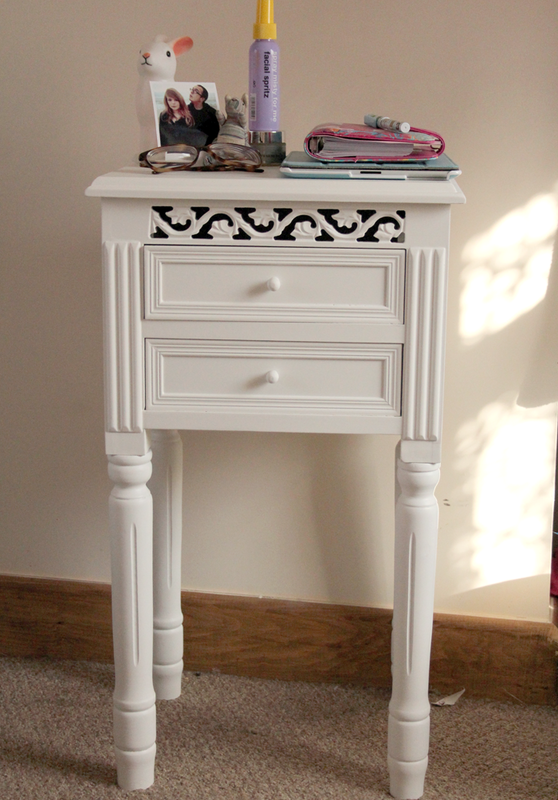 Love the bedside table its really sweet, I like how its a bit taller than the average bedside table too! I've been taken with the Anatomicals facial spritz as well. I hadn't thought of using it during these horribly humid nights but I think I will now! 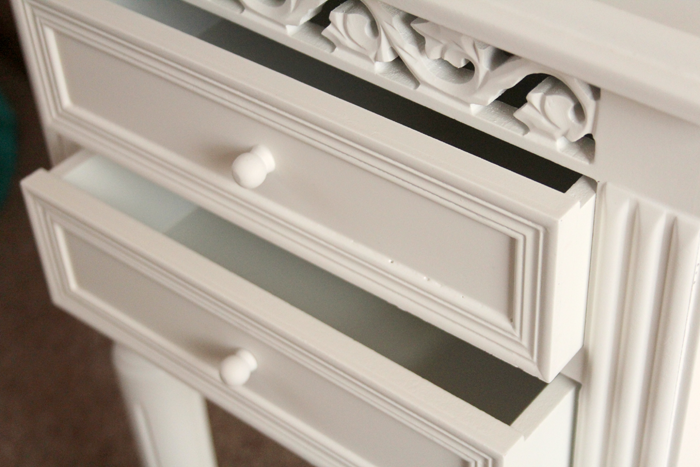 These drawers are lovely. I always like seeing other people's space and how their different tastes, ideas and habits translate to them. Love your nightstand and kinda jealous of not getting the Glossybox missed out on getting the facial spritz, damn! I love a good facial spritz when it's hot. This is random but I was feeling really hot and ill last night and I swear the Caudalie Beauty Elixir made me feel so much better and sent me off to sleep! 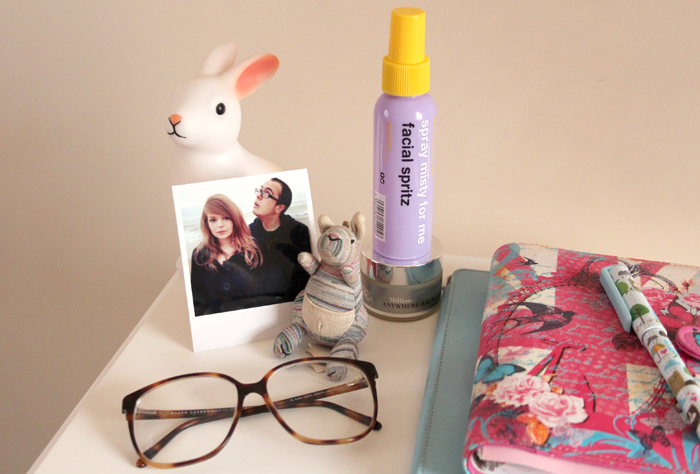 I try to keep my bedside table as neat as possible but it never stays that way!